The other day, Precious Ancient Chinese Medicine Classics Lost Overseas, a multi-volume series, was collected by our university library. Being 403 volumes altogether and published by Zhonghua Book Company, this series includes as many as 427 kinds of precious CM classics lost overseas, most of the books and versions that have been lost in China or that have few collections, which are of great value in versions and literature. 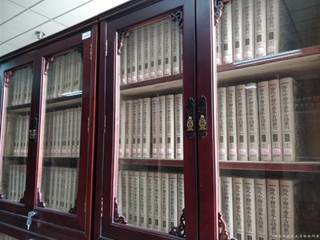 In summary of the meaning of the compilation and publishing of this series, “It can be used not only to make up for the loss of collections at home and combine the deficiencies of incomplete versions, but also to correct the errors of CM history,” concluded by Zhang Zhiqing, Deputy Director of National Library of China. The collection of Precious Ancient Chinese Medicine Classics Lost Overseas into our library is, on the one hand, the exemplary achievement of the return of contemporary overseas CM classics; it also enriches, on the other hand, the storage of CM classics and improves the quality of collections, which will provide a larger number of CM literature materials for the study and scientific research of teachers and students.